While the NHL All-Star Game has to deal with players pulling out due to injury, the AHL contest also has to deal with players being recalled at a moment’s notice. That forces the league to replace players regularly, and today they’ve added four new names to the upcoming event. While the NHL announced their All-Star rosters this week to the ire of some fans, there are other professional hockey players suiting up in a mid-season exhibition this year. The AHL has released their own All-Star rosters, which include both veteran minor league players and prospects still getting their feet wet at the professional level. With the NHL season now less than a week away, we continue our look at what each team has done this summer and what to watch for in the year to come. Next up is a look at the Detroit Red Wings. Key Additions: G Jonathan Bernier (free agent, Colorado), D Jake Chelios (free agent, Carolina), F Wade Megan (free agent, St. Louis), G Harri Sateri (free agent, Florida), F Chris Terry (free agent, Montreal), F Thomas Vanek (free agent, Columbus). Key Subtractions: G Jared Coreau (free agent, Anaheim), F Matthew Lorito (free agent, New York Islanders), G Thomas McCollum (free agent, Milwaukee, AHL), D Xavier Ouellet (free agent, Montreal), D Dan Renouf (free agent, Carolina), D Robbie Russo (trade, Arizona), F Ben Street (free agent, Anaheim), Eric Tangradi (free agent, New Jersey). 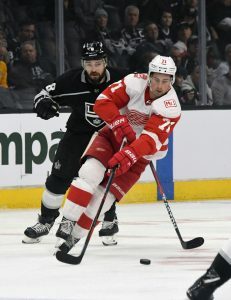 Player To Watch: F Dylan Larkin — The Red Wings finally have the star player they have been looking for after the 22-year-old posted a career-high 63 points last season and could be poised to take that next step this year after signing a five year, $30.5MM contract over the summer. A couple things that could fall in his favor are the fact that Larkin had a low shooting percentage last season, which should improve, while he also saw little power play time, which will obviously change this season. 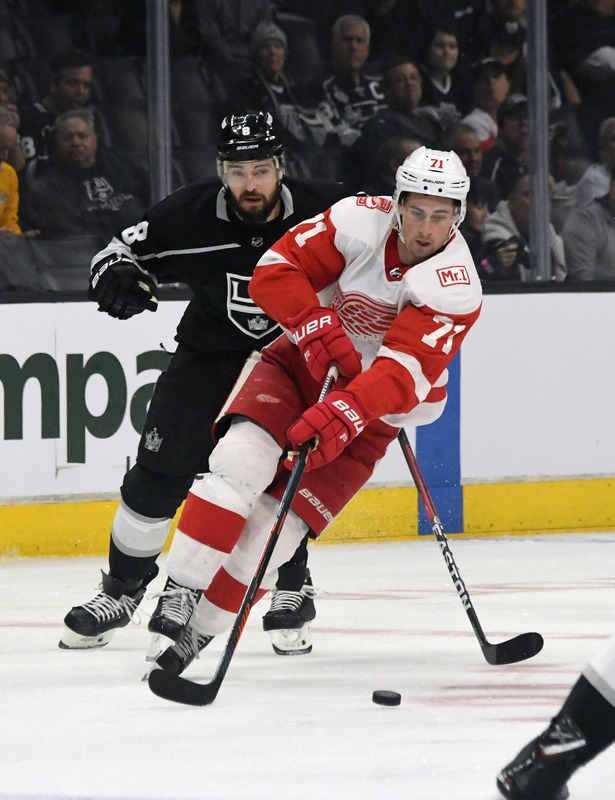 The best case scenario for Larkin would be to take his game up another notch and perhaps reach the point-per-game plateau, which he is more than capable of. A worst-case scenario might see him struggle to stand out amongst a stable of improving, but hardly amazing crop of forwards. The team can only hope that Larkin can prove he was worth the contract he received and can help lead Detroit move up in the standings. His elite speed makes him one of the best to enter the offensive zone with the puck on his stick, but he must prove that he can put the puck away as well. Key Storyline: The youth movement is truly beginning this year as several young players look to have legitimate chances to make the roster, including 2017 first-rounder Michael Rasmussen and 2018 first-rounder Filip Zadina. While there has been no guarantee they will make the NHL roster, both have shown their offensive talents off and even if Zadina gets sent down, the 18-year-old can play in the AHL instead. Regardless, a team that was (and still is) an older, veteran team is starting to change its look. The team is also expected to make some changes on the defensive end of the ice as several young defensemen are challenging for an NHL roster spot, including Filip Hronek, Joe Hicketts, Dennis Cholowski and Libor Sulak. The goal is the team should slowly build its way to a young, rebuilt roster. Overall Outlook: The Red Wings are in a tough transition phase that should keep them near the bottom of the NHL for another season and perhaps give them a shot at consensus No. 1 overall pick Jack Hughes next season. With so many aging players that are clogging up their cap, the best fans of the franchise can do is hope that their young players develop as fast as they can to give the team a hope for the future. Obviously, Smith is the star of this group and easily the biggest name to hit the wire so far this year. The decision to placed the veteran forward, a career Senator entering his eleventh season, on waivers is a curious one. Admittedly, Smith did not play well last season; beyond only recording 19 points in 68 games, he logged a brutal -32 rating, saw a drop-off in face-off success, and struggled in many possession metrics. Nevertheless, he remained a favorite of head coach Guy Boucher and saw a career high in ice time. After losing the likes of Erik Karlsson and Mike Hoffman this summer, Smith – while not the strongest player – was one of the few loyal locker room leaders left in Ottawa. There has already been a negative response, as Matt Duchene called the move “a kick in the balls” for the locker room, according to TSN’s Brent Wallace. For some reason, the team has decided to move on, one way or another. TSN’s Darren Dreger reports that the Senators have been shopping Smith for some time and had trade interest, but were not able to come to an agreement with any of the teams not included on Smith’s limited list per his modified No-Trade Clause. Now, they will either lose him for nothing in return or have the ability to bury him in the minors if he clears. Such a demotion would clear $1.025MM in cap space of his $3.25MM salary. It is important to note when considering any potential claims, that Smith is signed for three more years, making his inclusion on waivers even more surprising. The group of Canadiens could also offer some appeal, particularly the 23-year-old power forward McCarron. Although the 2013 first-round pick has not lived up to expectations yet, he has the one thing you can’t teach and that is size. At 6’6″, 230-lbs., McCarron has the frame to do some damage at his spot on the right wing if put in the right system with the right line mates. It hasn’t happened yet in Montreal, but some other team may be willing to take a shot. Veteran grinder Froese, who played in 48 games with the Habs last year, could also get a passing glance, while trade recent Montreal trade acquisitions Shinkaruk and Valiev are somewhat intriguing albeit not likely to be claimed. Team in search of young, affordable fourth line help could look at the Bruins’ Blidh and Cave, although such a move is unlikely. The same goes for Haggerty, whose placement on waivers comes as surprise, given that no contract has of yet been announced with Pittsburgh for the Wilkes-Barre/Scranton Penguin. The Detroit Red Wings have announced another set of signings today, adding minor league depth in the form of forwards Chris Terry and Wade Megan, defenseman Jake Chelios and goaltender Harri Sateri. Terry has signed a two-year deal, while Megan, Chelios and Sateri have signed on for one year. Salary terms have not yet been disclosed. Detroit is expected to graduate several players from the Grand Rapids Griffins this season, and needed some veteran additions to keep the minor league team competitive. Terry especially will be a huge boost to the offense, after his 71-point 2017-18 with the Laval Rocket. That was on the worst team in the AHL, something that the Griffins don’t project to be this season. Sateri, fresh off his NHL debut in Florida, will provide some more goaltending depth for the Red Wings as well. Though they now have Jimmy Howard and Jonathan Bernier at the NHL level, Jared Coreau left the organization and they needed some more experience in the minor leagues. He’ll fight for the full-time starter role there, and try to work his way back up to the NHL should any injuries arise. After announcing their All-Rookie team earlier this week, the AHL have now given us their choices for the first and second All-Star Teams for 2017-18. These players were voted in by coaches, players and media all across the league. *Niku and Appleton were also named as part of the All-Rookie team. Of course, much of the fanfare will go to Niku and Appleton who were not only rookies but late-round draft choices. Their appearance on the list is so impressive, especially given the success of the Jets already graduated young core. With a pipeline of talent, Winnipeg should have a wide open window of contention. Probably the most interesting name though is Hutchinson, as he’ll be an unrestricted free agent at the end of the year. One has to wonder if he’ll get a crack at an NHL job, given his outstanding minor league season and reliatively successful experience at the highest level. He’s making $1.3MM this season, but could look for a larger opportunity elsewhere while Connor Hellebuyck, Steve Mason and Eric Comrie man the crease in Winnipeg. The last Friday before the season begins, and just a few more days until teams have to submit their final rosters. As we head into the final few preseason contests, some teams are still holding onto a huge roster. The waiver wire is sure to be filled over the next few days as teams make their final cuts. As always, we’ll have all the movement right here throughout the day. F Kenny Agostino – Waivers for purpose of assignment. D Ville Pokka – Waivers for purpose of assignment. D Duncan Siemens – Waivers for purpose of assignment. F Anton Rodin – Will be placed on waivers tomorrow. Waivers are coming fast and furious as teams have to have their final rosters submitted by the evening of Tuesday, October 3rd. After Jordan Nolan was claimed a couple of days ago, everyone on waivers yesterday cleared. Here is the list from today thanks to Renaud Lavoie of TVA Sports, which contains quite a bit of NHL experience. There are also bound to be a few recalls over the next few days, as injuries and poor performance lead teams to reconsider their original decisions. After rumors of the deal yesterday, the Anaheim Ducks have announced the signing of a one-year extension for young winger Logan Shaw. Though the team has not released the details, Renaud Lavoie of TVA Sports reports that the deal is one-way and will see Shaw earn $650,000 next season. 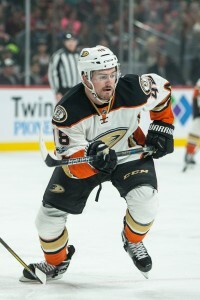 Shaw was the return for Michael Sgarbossa earlier this season from Florida, and has turned into an effective bottom-six penalty killer for the Ducks. In 43 games, he has just five points and has never been much of a scoring threat even going back to his junior hockey days. Instead, he is a big body who can skate well enough to effectively defend and give the team a bit of energy. He also gives Anaheim another body to expose in the upcoming expansion draft, not unlike Chris Terry for Montreal. While the Ducks will likely have to go the eight skaters route leaving them perfectly covered in the 70/40 expansion requirements up front, if they can work out a deal with Vegas or move one of their defensemen prior to the draft, they may have been stuck with just Jared Boll meeting the requirements up front. They now have options as Shaw and Boll will definitely be left exposed. The Montreal Canadiens have re-signed minor league forward Chris Terry to a one-year extension that will keep him in the organization through 2017-18. Though he hasn’t played much in the NHL this season, Terry will help to fill one of the forward requirements for the Canadiens at this summer’s expansion draft. He played 68 games last season for the Carolina Hurricanes and 14 this year for the Habs, making him eligible for the 70/40 requirement—not that the team was going to have much trouble, it is always good to have more options heading into the draft. Terry was drafted in the fifth round a decade ago, and has turned into a prolific scoring winger in the AHL. With 351 career minor league points, Terry ranks among the top in the AHL each season. His NHL career hasn’t turned into much, though he did play regularly on Carolina the past two seasons. With just 38 points in 152 games, and close to turning 28 years old, he seems destined for a minor-league career. More deals like this will be made over the next few months as teams finalize their expansion lists. The trade deadline changed a lot of rosters despite mostly dealing in rental players. The draft has provided players like Terry with a unique opportunity to sign a deal (with Eric Engels of Sportsnet even reporting that it is a one-way contract) when one may have not presented itself under normal circumstances.